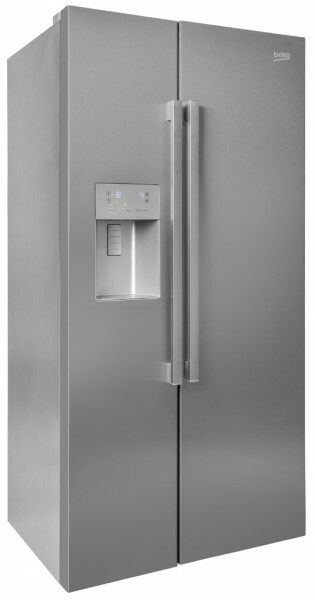 Product information "Beko ASP341X American Fridge Freezer"
Extremely spacious, a consistent air flow and high energy efficient make this fridge freezer a striking and stylish appliance that compliments your kitchen and enhances productivity in a busy lifestyle. Frost prevention, fast freezing and a automatic ice and water dispenser ensure that the ASP341X American Style Fridge Freezer meets the demand of advanced technology in the kitchen, providing you with fresher food for longer. Giving you space for up to 368 litres in the fridge unit and 176 litres in the freezer unit, you can easily bulk up on your weekly shopping without having to worry about lack of storage space. The Chiller Compartment is ideal for storing fresh and cooked meat and fish for longer with a minimum temperature control of 0�C, whilst the Dairy Compartment keeps dairy products fresher for longer. There is a wine bottle rack and in-door ice maker giving you more unique features. Making sure that odours are not transferred between the fridge and freezer compartments,NeoFrost ensures that your foods maintain their freshness for much longer. The two fans and evaporators maintain a healthy level of humidity and freshness so that odours remain inside their respective compartments and don't contaminate the flavour of other foods. Maintaining a hygienic appliance is much easier with the ASP341X and its many self-cleaning features. There is less chance of bacteria developing thanks to the Antibacterial Door Seal, which prevents bacteria from entering the fridge. The Odour Filter prevents nasty odours from developing inside the fridge, maintaining freshness for longer. Part of the EcoSmart range from Beko, this appliance has an A+ Energy Rating ensuring that your energy consumption is low, saving you money and benefiting the environment. The External LED Display gives you complete control of the temperature of your fridge freezer, saving you time and energy. Side LED Lighting makes it easier to find your food and drink, whilst proving a brighter and more energy efficient lighting solution. Related links to "Beko ASP341X American Fridge Freezer"
Customer review for "Beko ASP341X American Fridge Freezer"